​Published by IFWG Publishing in Aug 2011, this is my first published novel. Set in 1698-1701, it follows the adventures of a young street urchin as he is thrown into the Scottish Darien venture. Edinburgh, 1698. Scotland's crops had failed again, and starvation was building in the cities. A plan was hatched to colonize Panama, ship goods overland, and hence shorten the voyage to India. Half the available cash in Scotland was raised to support the project. Five ships and three thousand souls set off on the venture to be the salvation of an ailing nation—a four thousand mile journey into the unknown. Jamie Leith, a young street-wise teenager, inadvertently stows away, and wakes, a prisoner of the venture and manacled to its success or failure. Determined to survive at all costs, Jamie faces enemies, storms, and sickness, with optimism and a ‘ne'er say die’ attitude. With the courage of youth, and endurance and instincts learned from the streets, he confronts all obstacles to give his all in the success of the venture. ​‘Opportunities’ is the story of the Darién Venture seen through the eyes of this precocious youngster, and is a roller-coaster adventure set within Scotland’s ‘last chance’ at survival. Jamie Leith embodies the positive spirit that lies in all Scots; the rampant strength of character that sailed the seven seas and drove a population to the four corners of a rapidly growing world. Scotland's hopes for continued independence from England rest on a secret mission to the Caribbean. The Jamie Leith Chronicles tell the tale of the adventures of an Edinburgh youth who inadvertently stows away on the mission ships. Tied to both the venture and the treasonous attempts to destroy it, Jamie is the quintessential spirit of Scotland... bold, brash and tireless. Enter the world of The Jamie Leith Chronicles, the new serialized version of Jamie's exploits, some of which is previously told in the epic novel, Opportunities. Caledonii; Birth of a Nation. Part One: The Great Gathering. Published on Kindle in Sept 2011, this is the first in the Caledonii series. The year is 74 AD. The Roman Legions have held control of Southern Britain for 19 years. In that time they have solidified their hold, and put down tribal rebellions by Boudicca of the Icenii, and Venutius of the Brigantes. With the tribes pacified at their backs, the Romans advance their roads northward, with their goal: the conquest of the whole of the British Isles. The Northern Druids, realizing this, have arranged a meeting of all seventeen tribal, or clan, chiefs. Amidst the bitter local rivalries, and deep-scored bickering, the Druids try to unite the clans together to face the oncoming Roman threat. Calach is the fifteen-year-old eldest son of the chief of the Caledonii Clan, and is cast into clan politics for the first time. Destined to be chief one day, and acknowledging the importance of such a gathering, he is bewildered by the chief’s antipathy to each other. Part One is over 100 pages, and runs over 30,000 words. Caledonii: Birth of a Nation. Part Two: The Druid's Plan. The year is 74 AD. The Druids’ attempt to unite the clans against the oncoming Roman threat has failed. Dashed to pieces by ancient tribal squabbles. 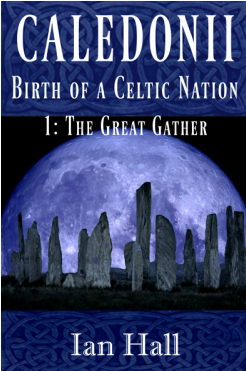 Calach of the Caledonii, and Finlass of the Meatae, both chief’s sons, have hatched a plot to unite the clans despite what their fathers decide. Calach is summoned to the Arch-druid, in far distant Votadin lands. He is accompanied by Sewell, his own clan druid. It is essential that Calach keep his plan from the druids, and learn as much as he can on his first journey outside Caledonii lands. Thus begins Calach’s adventure, as he takes the first steps on a path he cannot retreat from. As their plot grows, the clans come together, and the traitors come out of the bracken. Part Two is over 130 pages, and runs over 35,000 words. Caledonii: Birth of a Nation. Part Three: The Coming of Age. Published on eBook (Kindle etc) format in Dec 2012. With the Romans still making preparations to Invade, Calach must keep his plans for the unification of the Clans uppermost in his mind. Calach is forced to deal with years of nothing; a phoney war. His brother Uwan's druid training is in full swing, but soon he finds himself out of his depth, as the other druids turn against him. "The Coming of Age" is exactly that. A time for Calach to grow up and face the responsibilities of his prior actions. Part Three is over 120 pages and runs over 31,000 words. At last, after spending four years in the preparation, the Romans invade Scotland. Calach and his band of multi-clan raiders ride south to lend a hand. When they arrive, no one could have trained them for what they encountered. Calach has to battle inter-clan leadership issues, his own father, and escape from his most perilous position ever. "The Romans Invade" is a page-turner by anyones standards. Part Four is over 110 pages and runs over 31,000 words. As the Romans press their advantage in lowland Scotland, Calach of the Caledonii clan must ready his forces for the imminent Roman invasion of the highlands. His brother Uwan, a young emissary of the druid brotherhood has a plan to end the war with as little bloodshed as possible, and must embark on a dangerous voyage to the heart of Rome itself. Between the two, they hold the very future of the country in their hands. This is where blood will be shed. 5. Druid's Work is part five of Ian Hall's Caledonii series. Following the adventures of Calach, the eldest son of the Caledonii clan chief. A Scottish Rant on Ancient Roman Political Spin. In 80AD, Rome invaded Scotland for the first time. Julius Agricola made quick advances, fighting, bribing and pacifying each local tribe. When he entered the higher ground, however, he found himself faced with a coalition, a union of the tribes. For three years the two armies campaigned against each other, culminating with the Battle of Mons Graupius. In this book, the author postulates that, since no battlefield has been found, perhaps the details regarding it (Written by Tacitus, Agricola's son-in-law, many years later) Agricola was just giving the Emperor back home the news he needed to hear. The book is drawn from the authors prize-winning website, and has been researched extensively. With many photographs, the book brings the reader back in time, to 'see' the data for himself. A great read for student, historian, or anyone interested in the truth.